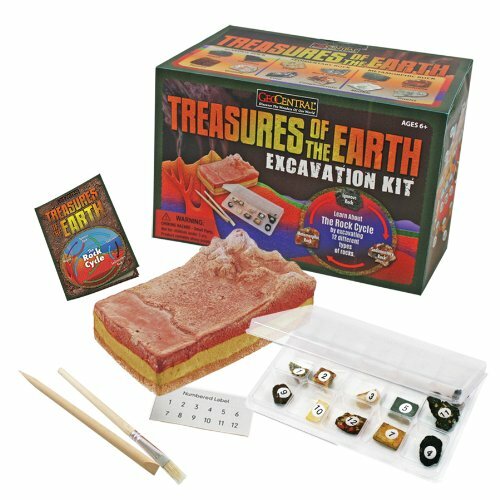 Geocentral Treasures of the Earth Dig KitDiscover the Wonders of Our Worldwith the Geocentral Treasures of the Earth Dig Kit! Uncover 12 minerals fromthe 3 different layers of the Earth. Contains: Multi-colored earthen block,digging tool, brush, identification key, numbered identifiers and display box.While excavating the minerals, learn about the different layers of the Earth.A great gift for any aspiring geologist. From the Manufacturer Unearth and identify 12 gunuine minerals just like a paleontologist might.